The Presentation Zen blog was one of the biggest inspirations for Better Posters. 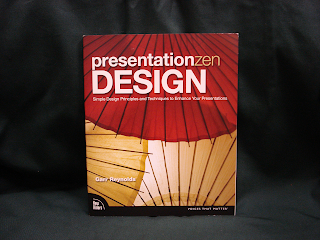 As you can imagine, I was very much looking forward to Garr Reynold’s new book, Presentation Zen Design. The book’s title hinted that it would contain more lessons that could be applied to poster design than its predecessor, Presentation Zen. This was correct, although the balance in Presentation Zen Design is still more towards slides in particular than design generally than I expected. And there are big chunks of the book that are really about delivery of the presentation more than the design of the presentation, like a sidebar by entrepreneur David Rose. Too many choices often leads to hurried and arbitrary decisions about what typeface to use. So having six to ten typefaces that you understand well and use often is a good base from which to start. Presenters can improve many visuals just by using three basic color combinations based on the color wheel: monochromatic, analogous, and complementary. The hardest thing to do is to edit yourself – to stop adding more. It’s up to you to make the tough decisions about what to include and what to leave out. Contrast is indeed fundamental to good design, and without white space, good contrast cannot be achieved. The leading cause of lack of contrast is clutter. Too many layers of visual complication make contrast weak, if it even exists. The important thing to know is that if you use images of people – whether you intend to for the image to be a focal point – you must know that this is where people are going to look first. There’s so much good stuff in those single sentences, imagine what having an entire book of that is like. It’s clearly written, well illustrated, and has a wonderful feel that it was written by someone who is sincerely trying to help. I wouldn’t recommend it if you just wanted to figure out how to do a poster presentation. If you do poster presentations, however, you will in all likelihood also have to do talks routinely, too. If that’s the case, this book will serve you well.